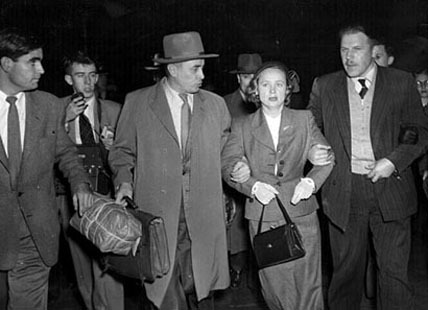 Evdokia Petrov, flanked by two Russian couriers, is escorted to the plane at Mascot Airport. 19 April, 1954. Image courtesy of Gary O’Callaghan (second from left). Rarely does a political event capture a nation’s imagination like the Petrov Affair. In 1954 the Petrov Affair dominated Australia’s headlines. For months Australians devoured stories of espionage and charges of political conspiracy. The Petrov Affair was played out against the background of the Cold War – the rivalry that developed during the second half of the twentieth century between countries espousing different political ideologies. The Cold War was characterised by mutual distrust and suspicion.